3D printing is making it drastically easier to produce infinite identical copies of anything, for better or worse, for humanitarian or for destructive purposes. A replica of Michelangelo’s David can be made at home just as easily as an assault rifle. While the relatively new technology of 3D printing is proving popular with designers, fabricators and the general public, it hasn’t yet reached the ubiquity of the home printer. But it will. A recent trip to the Makerbot store, a 3D printing boutique in Manhattan, has absolutely convinced that “desktop” 3D printing is poised to change the world. I saw nine-year-old kids using basic CAD software to make their own toys. It doesn’t take much imagination to envision a near-future where toys are downloaded like books or songs or movies. Print-on-demand custom lego bricks or minifigs are the kinds of things I would have dreamt about as a child if I could have even imagined the possibility. 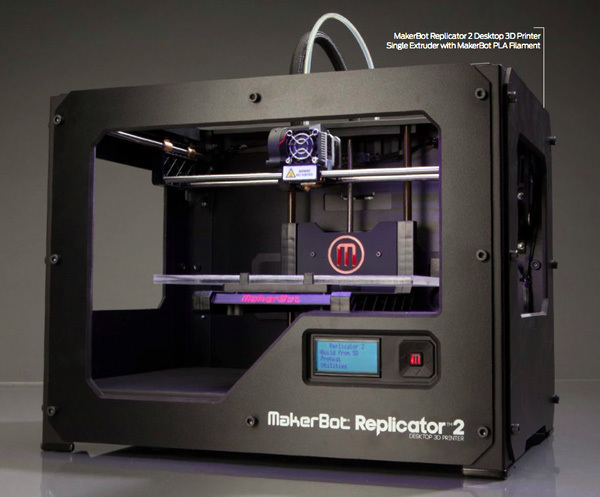 It’s only a matter of time until desktop fabrication is as common as desktop publishing. The technology is getting cheaper and more efficient every year. By reducing images to carefully calculated coordinates and documenting the method by which the original was created, Alberti ensured that anyone could produce copies that were exactly identical to his original work. The numeric manuscripts, which were easy to copy without error, represented a type of Renaissance era file transfer. The most impressive of these techniques describes a method for accurately copying a statue. In his treatise on figural sculpture, De statua, Alberti described a method of reproducing identical copies of sculptures using traditional tools and basic computation. First, the artist/copier takes precise measures of the sculpture’s height, width and its various diameters using the proper tools – t-squares, angles, etc. The main components of the sculpture are measured and documented numerically —“scanned,” if you will—in relation to one another and to the entire length of the statue. To get more precise measurements of the statue’s details, a device of Alberti’s invention known as the definitor or finitorium is installed atop the statue. The finitorium is a flat disc inscribed with degrees joined to a movable arm, also inscribed with measurements; from the end hangs a weighted line. By rotating the arm and raising or lowering the plumb line, it is technically possible, although surely infuriatingly slow, to map every single point on the statue in three-dimensional space relative to its central axis. That data could then be sent to a craftsman who would use it to create an identical copy of the original statue. Or, it could be sent to craftsmen who each create a portion of the original statue. Using Alberti’s method of “digitization” these individual components could even be fabricated in different cities and seamlessly assembled to create an exact replica of the original—a process that sounds a lot like modern manufacturing. This brings us back to 3D printing. There are many different kinds of 3D printers that create models from various types of plastic, but they all essentially work the same. The printer processes digital blueprints—coordinates located in virtual space—of an object created by modeling software and digitally “slices” the model into pieces small enough to be created by the machine. These components are layered on top of one another in incredibly small increments and are bound together almost seamlessly, creating an identical physical reproduction of the original digital model. 3D scanning and printing is obviously much, much faster than Alberti’s method, but it functions in much the same way—except, of course, for the automated documentation of an object’s shape and the robotic construction using synthetic materials. With both the old and new technologies, any statue—any thing, really—can be theoretically recreated at any size anywhere. Take, for instance, Michelangelo’s David. 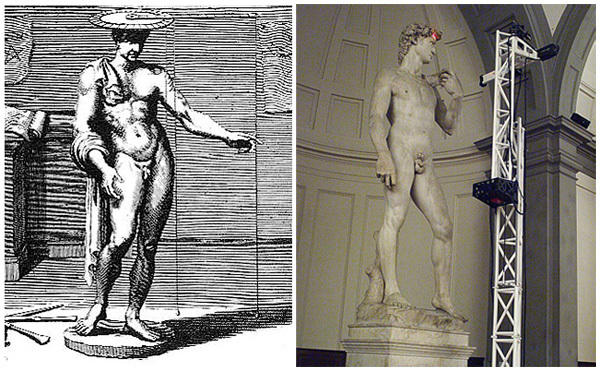 In 2000, Stanford labs created a digital 3D copy of the David that art “users” can rotate and manipulate to examine the sculpture in much closer detail than would be possible if they were to visit the original in Florence. In 2009 Stanford made drastic improvements to their earlier model with a full-resolution (1/4mm) 3D model of Michelangelo’s 5-meter statue that contains nearly 1 billion polygons. It may be the largest existing digital model of a scanned object. 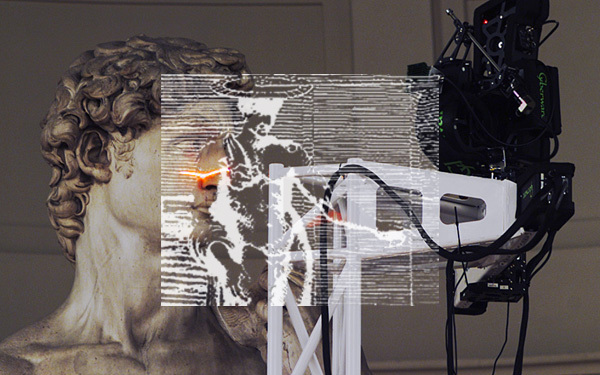 From six tons to thirty-two gigabytes, the digitized replica of Michelangelo’s masterpiece can now be reconstituted in the studio of anyone with a high-speed internet connection, enough hard drive space, and a Makerbot. The flexibility afforded by the digital model creates entirely new ways for people to experience the statue. See the above image for one such example. At a much larger scale is the enormous golden reproduction known formally as David (inspired by Michelangelo), which was created in 2005 by conceptual artist Serkan Ozkaya and is currently installed in the 21c Museum in Louisville, Kentucky. 3D printers and other forms of digital fabrication will change the way we live. But the ideas behind these paradigm-shifting machines have been around for a long time, and the dream of sharing and creating identical copies dates all the way back to the 15th century. Scientists, artists and philosophers like Alberti lacked the technological sophistication to make their ideas practical, and, in some cases, they lacked the imagination to even realize the possibilities of what they proposed. But that’s no longer a problem. We have the technology. And the designers of tomorrow –perhaps even the children of today– will realize the dreams of the Renaissance. Drones can’t just destroy, they can build. Although the military uses of drones are widely debated, less discussed are their potentially revolutionary civilian implications. They aren’t yet widespread, but drones are being used by hobbyists, photographers, farmers, ranchers, and they may even herald an entirely new type of architecture. Last year, Swiss architects Gramazio & Kohler, in collaboration with Raffaello D’Andrea, developed “Flight Assembled Architecture” – an experimental concept structure that employed small, unmanned aerial vehicles programmed to build. Created as an installation for the FRAC Centre in Orléans, France in early 2012, the project models a speculative construction system that integrates robotics, digital fabrication, engineering, and design. 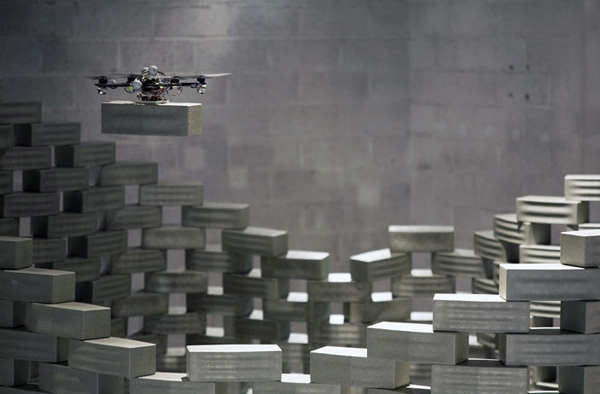 Several small robotic “quadrocopters” lift 1,500 foam blocks into a complex cylindrical tower standing more than six meters high. The tower is a model for a speculative future habitat that would stand more than 600 meters tall and house 30,000 inhabitants. It makes sense to illustrate such a revolutionary concept with a skyscraper – after all, the skyscraper wouldn’t be possible if architects and engineers hadn’t embraced technologies such as steel construction and elevators. Construction drones are the bleeding edge of speculative building technology and they’re perfectly designed to create high-rise buildings in urban areas where construction can be incredibly difficult and costly. As Kohler noted in an essay for the architectural journal Log, “the conditions of aerial robotic construction are entirely liberated from the bottom-up accessibility of material, man, or [existing] machine.” These robots can create buildings without erecting scaffolding or using cranes. Drone-built designs aren’t beholden to current construction limitations and their use opens up a new possibility of architectural forms. As drones become increasingly common tools of war and surveillance on the battlefield and in our cities, how are architects and designers responding? Previously, we’ve looked at personal counter-surveillance measures, but it’s likely that future designers will move beyond the scale of the individual to larger projects such as drone-proof architecture or perhaps even urban-scale counter-surveillance. Concerned about what he sees as the improper or unjustified use of drones, law student Asher J. Kohn has imagined how an anti-drone city might look and function. This isn’t a science fiction [cscenario, but a seriously considered urban design strategy. In fact, considering that the speculative plan for what Kohn has named “Shura City” is designed to counter the most technologically sophisticated weapons ever developed, the proposal is surprisingly low-tech. Design Decoded: When is a Signature not a Signature? Thomas Jefferson’s “polygraph” device. Today it would be more properly called a pantograph – a tool traditionally used by draftsmen and scientists to reduce and enlarge drawings. The following post is excerpted from Design Decoded. President Obama was in Hawaii when he signed the fiscal cliff deal in Washington D.C. Of course, it’s now common for us to send digital signatures back and forth every day, but the President of the United States doesn’t just have his signature saved as a JPEG file like the rest of us lowly remote signatories. Instead, he uses the wonder that is the autopen – a device descended from one of the gizmos in Thomas Jefferson’s White House. 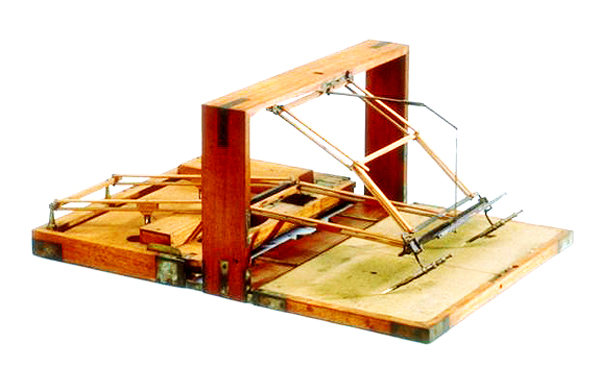 A precursor of sorts to the autopen, the polygraph, was first patented in 1803 by John Isaac Hawkins and, within a year, was being used by noted early adopter Thomas Jefferson. Known formally as the “Hawkins & Peale’s Patent Polygraph No. 57,” this early copy device was used by Jefferson to make single reproductions of documents as he was writing them. Though obviously less advanced than today’s electronic autopen, and used for a different purpose, the polygraph is similar in that it ultimately created a signature that wasn’t technically written by the President. While both devices are incredibly convenient, they raise a compelling question: is a signature still a signature when it’s not written by hand? Digital media theorist and architectural historian Mario Carpo has written extensively on the relationship between early reproduction methods and modern digital technologies. In his excellent book, The Alphabet and the Algorithm, Carpo notes that ”like all things handmade, a signature is a visually variable sign, hence all signatures made by the same person are more or less different; yet they must also be more or less similar, otherwise they could not be identified. The pattern of recognition is based not on sameness, but on similarity.” That statement may seem obvious, but it’s important. The variability of a signature denotes its authenticity; it reflects the time and place a document was signed, and perhaps even reveals the mood of the signatory. A digital signature, however, has no variability. Each signature –one after another after another– is exactly like the last. Although the modern autopen includes adjustable settings for speed and and pressure, these options are used for practical purposes and variability is only created as a side-effect. Today, the notion of a signature as a unique, identifiable mark created by an individual, is a concept that may be changing. The signature of a historic figure is no longer a reliable verification of authenticity that attests to a specific moment in history, but a legal formality.